1-01 From which country or region can I use Moverio Apps Market? You can use Moverio Apps Market in following countries and regions. 1-02 Can I use the account which I created on BT-200 for BT-300? Yes. You can login the market with same ID and password. 1-03 Can I change the password of MOVERIO Apps Market? 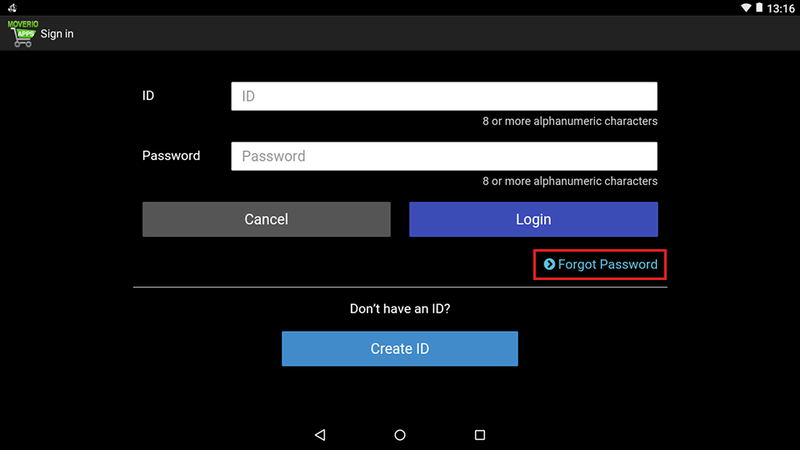 You can change the password from your MOVERIO device. After log in to MOVERIO Apps Market, please tap . then go to Account management and select change password. 1-04 Can I change User ID? 1-05 Can I stop (or restart) to receive email information about Moverio? You can change the setting from your MOVERIO device. After log in to Apps Market, please tap , then go to Account management and select Profile Update. * Please note that the important product-related communications will still be sent even if you unsubscribe from the information e-mail. 1-06 Can I change registered e-mail address? You can change the email address from your MOVERIO device. 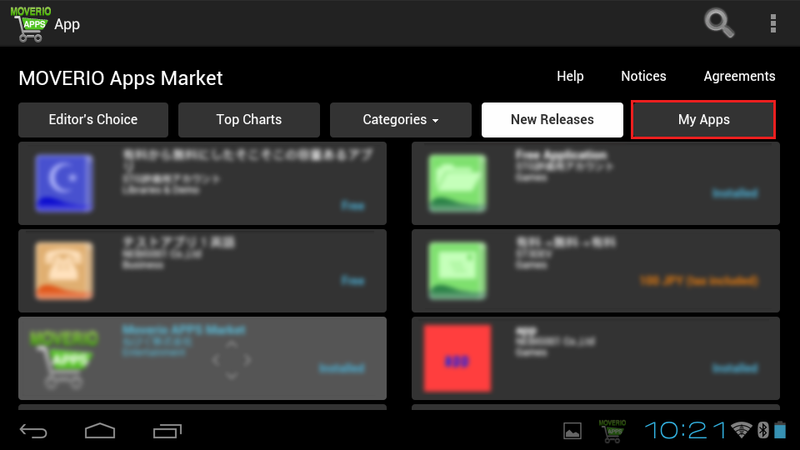 After log in to Apps Market, please tap , then go to Account management and select Profile Update. 1-07 If I forget the password and/or ID, how can I recover it? You can ask your ID and password from the Sign in Screen after launching the market app. If the apps list is displayed, please tap "Sign out" of the lower right screen, then start the app again. If you forget only the password, you can get it from this website. 1-08 Can I have additional account besides current one on my MOVERIO? Yes. Pease open new account at "Create account" of "Sign in" page. 1-09 How can I have an assistance of an application software usage or of resolving a troubles? Please contact an application software developer. You can have a contact information which is shown at an application software description. 1-10 How can I close the account of the MOVERIO Apps Market? You can close the account from your MOVERIO device. After log in to Apps Market, please tap , then go to Account management and select "resign". 2-01 How can I find an application software at MOVERIO Apps Market? Two ways are available. One is MOVERIO device, the other is remote installation from MOVERIO Apps Market website. 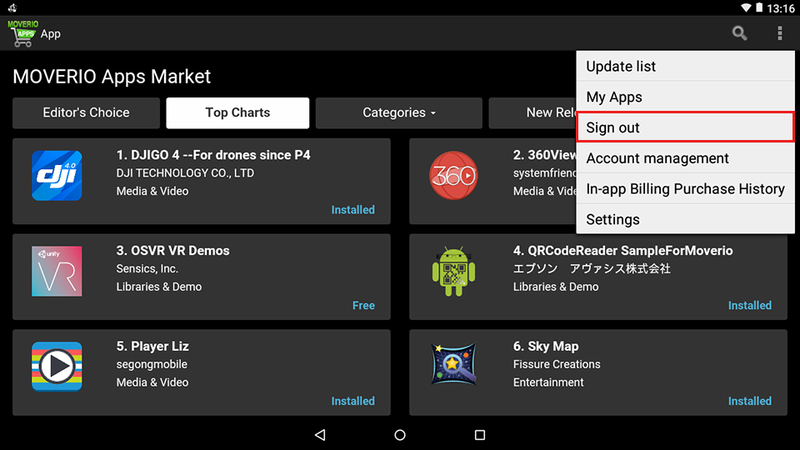 You can find an application software which is shown at Application List or Category of MOVERIO device. Those can be selected at first page of the MOVERIO Apps Market. From the MOVERIO Apps Market website of PC, smartphone, or tablet, please log in from following URL. Please note WiFi connection must be needed for MOVERIO device. 2-02 Can I download an application software from Moverio Apps Market to my PC? Yes. Remote installation is available from the MOVERIO Apps Market website. 2-03 Apps which installed remotely from PC, smartphone, or tablet will be installed to MOVERIO device automatically? Yes. However it will take some time cause of server check timing. If you want to install apps immediately, please tap apps at my page of MOVERIO Apps Market. 2-04 Can I stop auto installation from PC, smartphone, or tablet? Yes. You can change to manual installation as indicated below. 2-05 Will the apps installed on BT-200 be able to be used continuously after the MOVERIO Apps Market discontinued the service of BT-200 (as of Jul.2019)? Yes, all apps that you downloaded (installed) on BT-200 before the closure of BT-200 MOVERIO Apps Market can be used continuously. Therefore, we highly recommend you to download all necessary apps before the closure. 2-06 Can I download or use apps on BT-300 glasses after the closure of BT-200 MOVERIO Apps Market? Yes, after the closure of BT-200 MOVERIO Apps Market, you can still use the market on BT-300 as usual. 2-07 What is the meaning of "Age Requirement" which is described in application software description? It means that software user is required adult status which is regulated by law of user residential country or region. The user who want to download the age requirement software must declare user is adult. 2-08 During application software download process, the message of "Download is not completed." is showing up. Check a network connection out. Confirm free memory for application software download is good enough. Confirm above two and restart power on process of MOVERIO and try to download an application software again." 2-09 How can I confirm application software list which have already downloaded? After logged in MOVERIO Apps Market and select "My Apps". 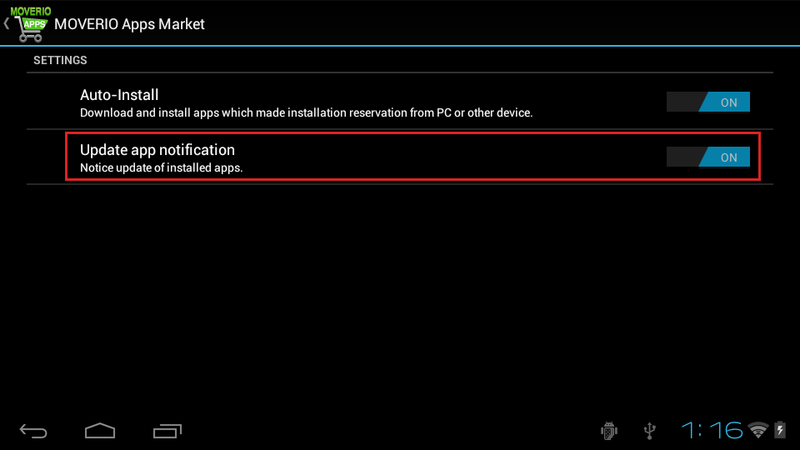 2-10 How can I uninstall an application software? 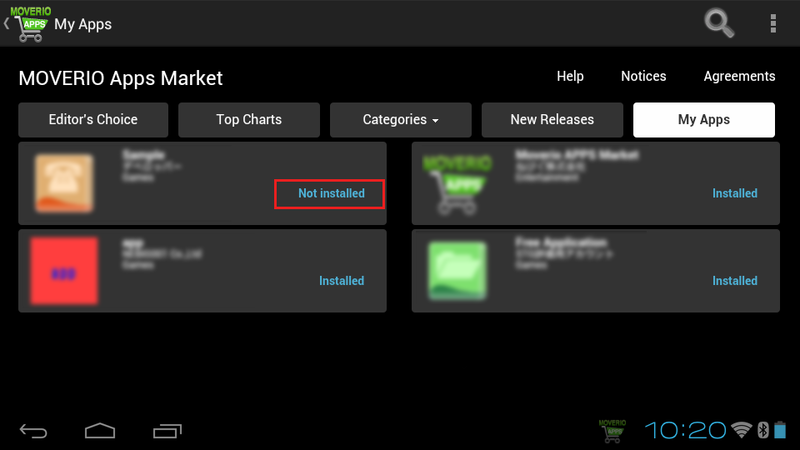 You can uninstall an application software at "My Apps" screen at MOVERIO Apps Market. Please select the application and tap "Uninstall". 2-11 I want to update the apps that were downloaded on the Moverio. 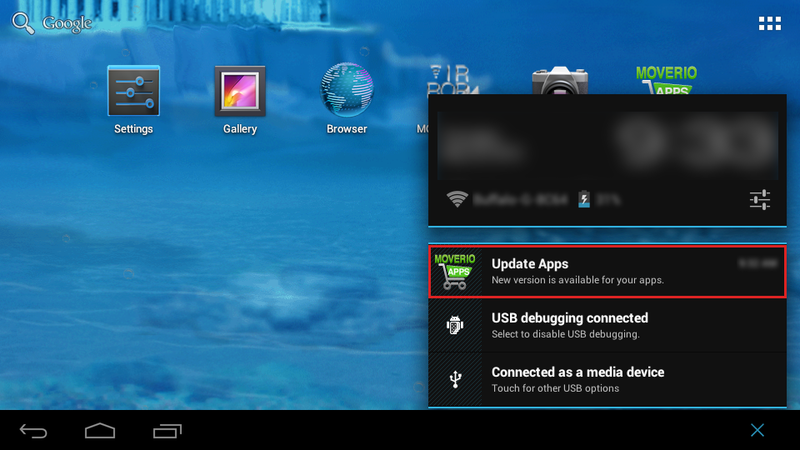 The app-update notice will show up on the Home screen when you connect your Moverio with WiFi. Please tap the update notice to download the latest version from "My Apps". For BT-200, please update the apps to the latest version before the closure of BT-200 MOVERIO Apps Market. 2-12 Can I get the BT-200 usable apps after the closure of BT-200 MOVERIO Apps Market? No. We are very sorry, but Epson can't provide you the apps after the closure. 2-13 Can I stop the update notice of installed apps? Yes. Please select "Settings" at the first page of the MOVERIO Apps Market, and change "Update app notification" to "OFF"
2-14 How can I download paid applications? You can purchase an application software by using PayPal account. Opening an account of PayPal is free of charge. When you purchase a application software, you will be transferred to a PayPal account opening screen and you can register it. You can open a PayPal account in advance by connecting with following URL by PC. 2-15 Its price is shown in US$. Can I pay for application software by Japanese Yen? Yes. You can pay by Japanese YEN. When you open a PayPal account, you need to specify your currency for the transaction. The exchange rate is specified by PayPal. 2-16 I can not get contents which I purchase by "Charging in the application software". How can I do? Please contact App developer. You can check contact information in App description. 2-17 Once I uninstalled a paid application software, do I need to pay again for downloading the same application software? No. You can download the same application software by free of charge. 2-18 Can I have refund of paid application software? 2-19 What is the meaning of "In-apps purchasing"? It means that it will be charged by application software when you will have an additional service such ad new contents supply from an application software. 2-20 Can you tell how I will pay for a "In-apps purchasing"? 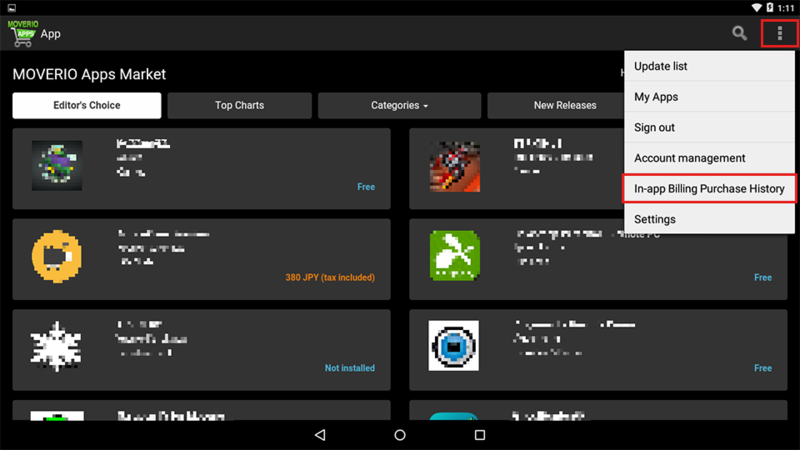 MOVERIO Apps Market will not support "in-apps purchasing". It will be operated by developer. You need to contact with the developer to know the detailed. You can have a contact information which is shown at an application software description. 2-21 Can I check my record of "In-app purchasing" with MOVERIO device? You can only check the specific apps on BT-300. When you purchase the in-app billing You can check your record if the display shows following screen. Please tap , then go to "In-app Billing Purchase history. As for other apps, please ask the developer for the record. 2-22 Can I download Application software from Google Play? No, you cannot. BT-200 is not certified by Googles CST.